A relative newcomer to the local food scene, Matt Robinson is quickly making an impact. 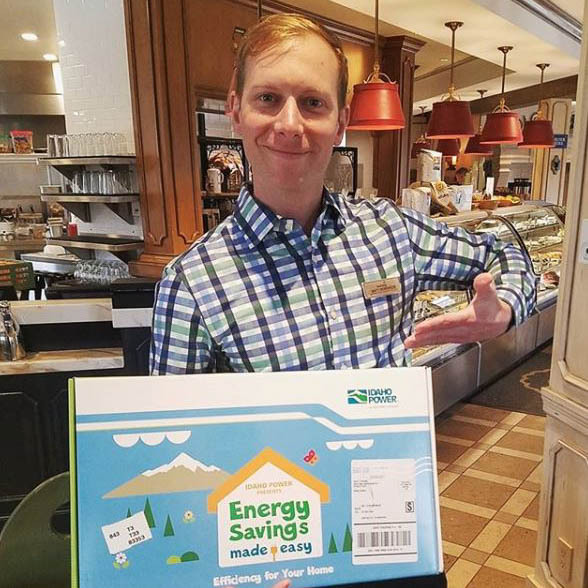 As manager of Konditorei Bakery and Cafe, Matt is leading the charge for local food procurement and environmental sustainability at Sun Valley Company. The Konditorei recently received a three-star Green Restaurant Association certification thanks to Matt's efforts to reduce the restaurant's environmental footprint. Matt shops the farmers' market weekly to pick up ingredients for the restaurants' Season's Best smoothie and other dishes. I first started working in the food industry during high school at a small Italian restaurant in the northern suburbs of Atlanta, Georgia called Provino’s. Growing up in the south, our food heritage and culture was everything. It was more than food though, it was about bringing together neighbors and family and building a connected community through our shared love for food. My all-time favorite southern dish is buttermilk fried chicken with collard greens, black-eyed peas and bacon with a side of cornmeal-crusted fried okra. How has your life has changed since moving to the Wood River Valley? Since moving to the Wood River Valley in 2006 at the tender age of 19, my life has changed in many ways. The main shift I attribute to the natural environment that surrounds us here. The Valley, and its plethora of wild and scenic places, has provided me the space to connect with the true essence of myself. Getting out in nature, and away from the hustle and bustle of city life, helped to quiet the racing thoughts and distractions in my head and created the space to connect with my heart’s desires. This led to a deeper understanding of who I am and helped show me the direction my life was supposed to be heading. What drives your passion for sustainability? I am passionate about sustainability because it’s through nature that we can truly connect with ourselves. Helping to protect and preserve the natural world is essential to our development and existence here on earth so we must be mindful of the impact we are having on it. I am driven to promote living a more sustainable lifestyle because life is precious and, if we wish to continue on for generation after generation, we need to change our actions now to help prevent the depletion of our natural resources and degradation of our environment. How is the Konditorei working to reduce its environmental footprint? The Konditorei is working hard to be more conscious of our day-to-day operations and the impact they have by focusing on six environmental categories: energy, water, food, recycling/composting, materials and chemicals. By identifying these specific impact areas, we have been able to focus on the reduction of each through procedural changes, better purchasing practices and staff education. In our efforts to be an environmental leader in our community, we partnered with the Green Restaurant Association this year and underwent an evaluation the reviewed our total operation and through that we received 3 Star Certified Green Restaurant status in February (5 stars being the highest.) This was achieved because of all the hard work that we’ve been doing over the past four years to improve our sustainability. What changes have you implemented at the Konditorei in terms of food sourcing? In our ag state, you’d think it’d be easy to get local food, but in an industry known for high staff turnover, slim margins and safety concerns, it has proven a logistical challenge. Our strategy this year has been to start small, work out the kinks along the way, develop relationships with local farmers and, as positive results are yielded, incorporate more local food into our business model and on our menu. This summer, we added a seasonal smoothie that features local ingredients sourced from the farmers’ market and, on every Tuesday, I would go down to the market and find the hottest seasonal ingredients that week and develop them into a smoothie we named Season’s Best. It’s been a huge success! Since then, I’ve also started to buy ingredients for other dishes and substitute existing products from other states with ones grown locally. Each week, it’s varied a bit given what’s fresh at the market, but it’s a start. The less distance your food travels, the tastier, better for the environment and more nutrient-dense it is. Cauliflower hash wrap with a peach and raspberry smoothie. What seasonal produce do you look forward to most at the farmers’ market? Do you have a food hero? Why do you admire them? Thomas Colin Campbell, author of The China Study and a biochemist who specializes in the effect of nutrition on long-term health. I admire him because of his devotion to improving the health and wellness of humankind through sharing his research about nutrition. Local food is about more than physical health, it’s about environmental health and phycological heath. Dr. Campbell dedicated his life to trying to understand the link between the foods we eat and our long-term health. Through his work writing The China Study, it became evident that the Western diet is not a sustainable one for improving health over the course of our lifespan and the common thread between healthy communities is a larger presence of local food. You do a lot of volunteering with local organizations. Why is that important to you? It’s where I find inspiration. People are amazing, and the more I connect with others and hear their unique story, the more connected I feel to myself and realize the depth of our interconnectivity to each other. We all are searching for something, and if I can help someone along the way, I believe that will create a ripple effect that will yield positive change. We love your Instagram posts (@environmentalwarrior). What inspires them? My posts are inspired by the desire to help make a difference for good and spread a positive message. Nature has provided me the space to connect with my heart and I know I’m not the only one, which is why it’s so important to protect it. It’s easy to lose touch of ourselves in the noise of the world, and if we don’t have those sacred places in nature, we risk becoming disconnected from our truth and without that our purpose becomes harder to find. My biggest wish for change in the food system to stop using unnatural methods for production. Whether it’s spraying pesticides or tricking chickens to lay eggs more frequently through mimicking day-night cycles, I hope we can come together and take a stand for doing things as nature would intend. Positive change has been taking place for decades in this arena, we just need to make sure it continues. What change(s) would you like to see in the Wood River Valley in terms of food? The first change I would like to see is more local food in restaurants. To help incorporate that, a system needs to be created that centralizes ordering for the chef’s ease. The challenge of ordering from 15 individual farmers creates incentive to use national food service companies because of time constraints and daily workload in the kitchen. All the chefs I know want to use more local food in their operations, they just don’t always have the time to, so we need to figure out a way to make it easier for them to make that choice. Another change I would like to see is in our school lunch program. I don’t have kids yet, but I know this has been a pretty hot topic around the nation for decades. I remember school lunches when I was a kid and they did not promote health. We’ve made some progress since then, but not fast enough if we want to reduce the rise of health issues in children and adolescence.